Sometime the surrounding ground does not lend itself for secure installs of canopies and tents. The stakes just will not hold. When this is the case you might consider using auger anchors. These 30 inch auger anchors are made by Shelter Logic, the experts in portable shelters. 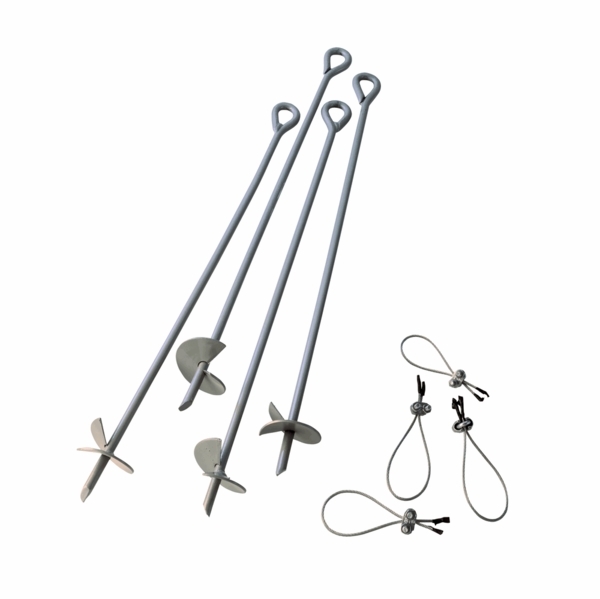 With these anchors you can rest assured that your canopy or tent is secure. These augers will corkscrew into the surface you choose. Then you will attach the tie down ropes to keep you canopy in position. How are these anchors secured to the frame of the canopy? Is there some sort of hole that allows them to go through the canopy cover? These anchors screw into the ground and then are secured to the base of the leg with a cable. There is no interaction with the top, at all. need to add extra stability. I ordered the 30" anchors to make my garage more stable. Soil is sandy and they seem to do the trick and anchored very well. This is a good quality item, but it was pretty hard for me to get into the ground. As long as you?re aware of that, I think you?ll like the product. I?m trying to be helpful here to other purchasers of these auger anchors. They?re a good quality product, but when I tried to use them in an area where the ground was hard and rocky just below the turf, I couldn?t. So if there are lots of stones where you want to use these, just be aware that it might be hard to use them.